1Department of Microbiology, Kamaraj College, Tuticorin-628003, Tamil Nadu, INDIA. 2PG and Research, Department of Botany and Microbiology, A.V.V.M. Sri Pushpam College, Poondi, Thanjavur-613503, Tamil Nadu, INDIA. Objective: To predict an anticancer drug from the members of cyanobacteria, in silico molecular docking was carried out between the cyanobacterial bioactive compounds and lung cancer causing receptor. The highest docking score was produced by Lyngbyastatin (Lyngbya majuscula). In the present study anticancer potential of L. majuscula was evaluated on human lung cancer cell line (A549) using its methanolic extract. Methods: Molecular docking was carried out between the Epidermal Growth Factor Receptor tyrosine kinase and cyanobacterial compounds. Based on the docking results, Lyngbyastatin was found to be the most effective compound. As this compound is present in the L. majuscula, the cytotoxicity of this organism was assessed by standard cell viability assays like MTT method. Algal methanolic extract treated with A 549 cell line morphology was studied by DAPI staining. DNA fragmentation assay was also conducted to study the presence of DNA laddering. Results: Totally 75 bioactive compounds were docked with Epidermal Growth Factor Receptor tyrosine kinase . Of them, 12 compounds were selected based on the docking score. Among the 12 bioactive compounds, Lyngbyastatin found to be most effective compound. L. majuscula showed potential anticancer activity against A549 cell line with IC50 value of 14.82± 0.62 μg/ml in MTT method. Most of the treated cells lost their characteristic stretched appearance with shrinkage of nucleus. DNA profile revealed the presence of sheared DNA in treated ones but no fragmentation was observed. Conclusion: The results indicated potent anticancer of algal methanolic extract on A549 cell line, which may be good candidates for further investigation to isolate bioactive anticancer compounds. 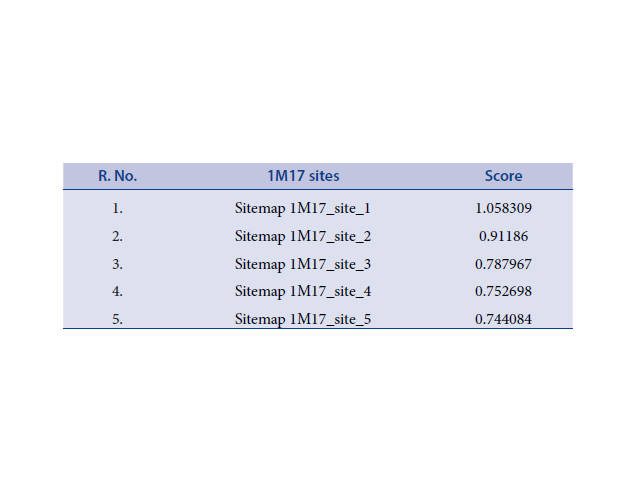 Sites scores of Epidermal Growth Factor Receptor tyrosine kinase enzyme. Muniaraj S, Subramanian V, Srinivasan P, Palani M. In silico and in vitro Studies on Lyngbya majuscula using against Lung Cancer Cell Line (A549). Pharmacognosy Journal. 2018;10(3):421-428.